Carol Herzer is an artist and psychic guide, her path in life has manifested through combining her art with helping others. The seeds for this work were planted in 1969 when she began work on her own tarot deck and became interested in astrology. Carol's tarot decks have been shown and mentioned in a number of tarot books; she has been making and selling decks since 1985. Carol received a Bachelor of Fine Arts degree in painting in 1969. Her paintings on canvas have been shown in galleries, with numerous shows in Seattle in the 1960's, and later in New York. Associated with the visionary art movement, she studied painting with Ernst Fuchs in Austria in 1972. Carol is and always has been a nature lover. Many of her paintings are landscapes, combining the inner and outer worlds. Carol Herzer's work includes pastel pencil drawings and paintings in oils and acrylics on canvas and watercolor paper. Many of the paintings on canvas are large pieces. She stopped painting in oils in 1979, but continued with large paintings on canvas in acrylics until 1986. Included is a group of paintings of the eruption of Mount St. Helens. A series of over 100 pastels was created between 1973 and 1977. These were done on flocked paper with pastel pencils, which give more definition than soft pastels. Half of them are landscapes. The remainder are inner landscapes with figures and faces. Recent work includes paintings in acrylic on paper. There is a range of themes in all of her work including landscapes, dream landscapes, portraits, and geometric mandalas. Carol usually does not know what will emerge in her paintings. Usually she will develop things over a period of time. Painting since childhood, Carol graduated with a Bachelor of Fine Arts degree in painting in 1969 from the University of Washington, Seattle. 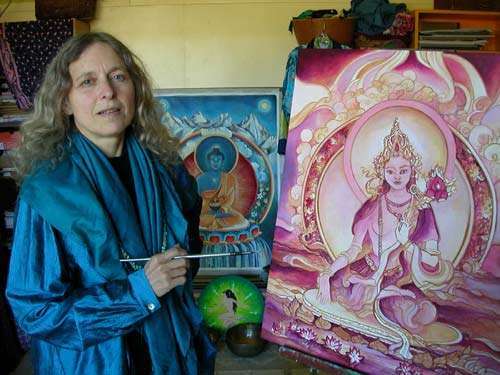 She studied with Ernst Fuchs in Austria in the summer of 1972, learning the misch technique and later applying its principles to her work with acrylic paintings.